Your generous donation will help perpetuate the memory of this remarkable woman. Donations to The Mary Lou Decossaux Memorial Fund may be made online: NRCcafe.org/donate, or mail your check to NRC. Please mention “Mary Lou” in the comments. We are grateful to have you as a friend of NRC. Read about the early days of NRC and Founder Mary Lou Decossaux’s amazing story here. It was a dangerous question, coming from Mary Lou Decossaux. “Nothing,” Penny Ferris bravely replied. “Well, we need a door right there,” Decossaux said. With her finger, she drew a door on one of the walls of the Neighborhood Resource Center, which she founded in the fiercely independent but economically limping neighborhood of Fulton in the East End. The wall was solid cinder block. Decossaux didn’t care. That Saturday, Ferris found herself with a drill in her hand. Others pitched in to help. And the door was opened. 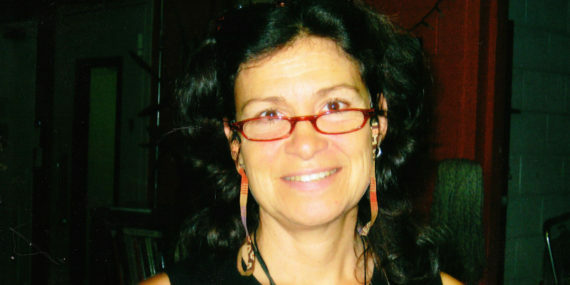 Decossaux died at her home on Dec. 27. She was 54. This is what you need to know about Decossaux: When she said something was going to happen, it happened. When she said the city ought to pay its workers enough to make a decent living, it did. Decossaux coordinated the Coalition for a Living Wage, a group that in 2001 successfully lobbied City Council to raise the wages for all city employees from the $5.15 minimum wage to $8.70. When she said an old post office on Williamsburg Road was going to become a community center, it did. Decossaux long saw the need for a place for Fulton residents to gather. After two years of fundraising, the Neighborhood Resource Center opened in January 2005. Around the same time, Decossaux was diagnosed with breast cancer. Last year she learned it had spread. But she wasn’t finished working. Not yet. When Decossaux came home to her beloved Fulton in May, she had one last project she wanted to complete. She asked neighbor Juliellen Sarver if she would help her go through some old papers that had belonged to a French ancestor. Sarver, who is fluent in French, quickly learned that these were no ordinary mementos. The rat-nibbled diaries, hand-written sheet music, photographs of bears and decades of letters told the remarkable story of Joseph Founau, the cousin of Decossaux’s grandfather. Shortly before World War I, Founau had left his ancestral village in the Pyrenees mountains to find his fortune. He traveled through the Americas, from Argentina to Florida to New York City, working in restaurants and, once, traveling with a performance troupe of men and dancing bears. While in New York, Founau discovered the YMCA. Fascinated by the organization’s novel approach to promoting fitness, nutrition and good health, he later returned to the village of Arrous and founded a sporting club for youth. It still exists. Decades later, Founau’s sporting club inspired Decossaux to lead the charge for Fulton’s community center. “These diaries, I guess they really just enchanted her,” Sarver says. The enchantment never faded. Decossaux’s last act was cataloguing the papers so they could be sent to a government archive in France for safekeeping. Sarver came to Decossaux’s house and read each piece; Decossaux then indicated to which stack it belonged. “It really seemed to energize her, even though she was getting more and more ill,” Sarver says. Yet the work wasn’t easy for Decossaux. She was weak, Sarver says, and she knew that she didn’t have much longer to live. In September the documents were sent to the archive. Even then, Decossaux didn’t rest. She enlisted the help of friend Joel Cabot to find a French publisher to reprint a new version of her book. She also wanted to translate the manuscript into English, a task she’d begun years ago but never completed to her satisfaction.